How to Use Amazon’s Best Seller List to Make Tons of Money. I don’t think I’ve ever heard any marketer, good or bad teach what I’m about to show you and that is how to make a lot of money using the best seller list on Amazon. I’ve used it a lot, though not as much as I should have, but it can work for any marketer and any niche they are promoting through. 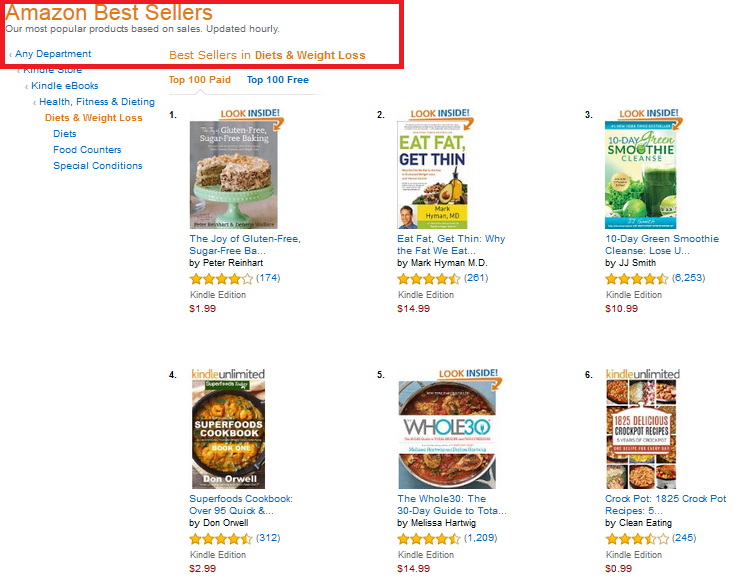 Amazon’s best seller list: What is it? There are millions of products being advertised, sold and purchased on the Amazon network. What they do is they categorize all products into different subjects and rank them on a scale based on how many are sold. There’s the regular one which if you type in the search bar on Amazon, you’ll get a list of various different products being sold well. This is the general one. Let’s call this the yellow option. Then there’s the one we’re going to focus on and that is the best sellers in each category. In other words, there’s a bunch of different best sellers there. Let’s call this the green option, aka the one which makes money. If you’re doing affiliate marketing, in MOST cases you will absolutely need to have a niche site. It’s one of the most stable ways to earn an income. If you don’t have one or do and don’t know if it’s good enough to work, try this program as it’s the best in teaching about niche monetizing. Now the goal of this tutorial is to help you find products related to your niche that are on Amazon’s best seller list. Remember, we’re using the second category (green option). Once you find them (it is going to ALWAYS be multiple ones), you can then use those topics/products, write about them on your niche site and make money through it. Anyone who has trouble with finding products to sell on their niche site can always rely on this method. Anyone who complains of too much market saturation won’t once they start using this strategy. Every product you will find using this method is HOT and always selling. This list always updates and new products hit the market, meaning there’s always something new and fresh to promote. Keyword competition for many of these products is VERY low and I will prove it. The niche I used to apply this method to was the weight loss one. There’s at least 3 different case studies I can point to where I found diet books that were selling very well on Amazon which I used to write articles on, get ranked for and the popularity of those products led a lot of traffic to my website which led to many more sales being made. Now 3 doesn’t sound like a lot and the truth is that it isn’t. I have not been using this method as much as I should because I’ve been focused on other niche sites, but even writing this right now, I am reminded of how important it is and I will be doing that right after I finish writing this article. But here’s something very cool: All you need is 1 good product to sell and that can provide you with all the profits you need. Obviously the more you can replicate this, the better and in my opinion, you should fully maximize on this opportunity! Step 1: Identify your niche topic. Step 2: Go to Amazon.com and in the search bar, type a keyword that is very vague but relates to the niche topic. I’ll go over a specific example further below. Step 3: Find the product which gets the most reviews. Click on it. Note: You can use that product as one of your topics to write about. Step 4: Scroll down on the product page to where it says “Amazon best seller rank” and select a SUB topic on that list to open up the REAL best seller list in that category. Step 5: Take every product you see on the best seller page, do keyword research on it, write articles about the most popular ones and this is what will bring in the traffic and money! Let’s use my weight loss site. That is the niche. 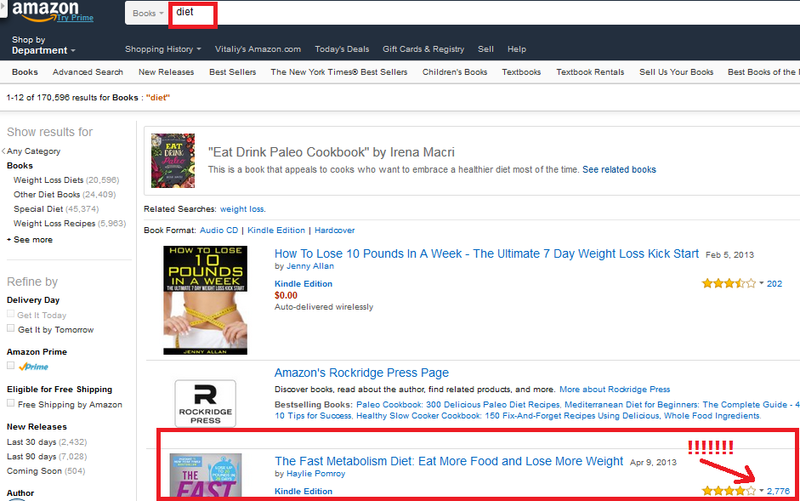 I visit Amazon and type in terms such as “diet” or “weight loss” in the search bar. Typically I’m looking for weight loss books. You can also use this to find supplements and fitness products, but preferably if your niche site deals specifically with those things. In my case, diet books are perfect. This was the 2nd result and it’s a product with nearly 3,000 reviews! And by the way, I don’t have any specific range of reviews you should look for, but typically several 100 means it’s very popular. We’ll go over how to write articles on that later, but imagine taking more than just 1 of these products you find and getting results like these? Add those potential numbers up and think about the money you could be making! Anyway, besides saving that product to write about later, I did click on it which is what you must do! As you can see, I have put different colored rectangles around each area. This is to show you which ones apply to me more. In my case, the red rectangle is the most relevant topic to my niche site. Thus, I will click on it to see the top seller’s list in that category. If your site is about a different topic which fits into those types of categories, you can also click on the other options to see a different, yet more relevant list to your niche. Note: If a product is new to a market, it will not get a lot of searches at first, so you have to sometimes take a risk and write about it with the hope that will become popular. I often do that. If you analyze the popularity you see on those products on Amazon vs the keyword stats, they look proportionally accurate. Now some of those terms I found are competitive and you don’t really have to worry about that. If you’re doing SEO, the whole purpose of looking over these products is just seeing if they are popular and if they are, write about. If the keyword you find for a product is competitive, find a lower competition version of it. But with possibly up to 100 different hot selling products for my niche topic alone, I have A LOT to write about. And I did say earlier that this list always updates because new, fresh products come into the market constantly, thus that list will change and new, possibly less/more popular products will come out. You will never see a decline using this method and will always have products to write about. And like I said, you can use this for any niche topic. Amazon is huge and they have enough categories to fit into your niche topic. This is almost as good as using Google trends, but through this method, you’ll always find products whereas with that one, it’s rarely going to be a huge goldmine if you’re niche specific. My final thoughts: Making the money. I’ve already shown you how just using one of those products and writing about them leads to more visitors coming to your site and as I said before, imagine doing this for several of them and even all the time. You WILL have a lot of visitors on your niche site. And if you’re starting out with a new website and have little authority, this fits in perfectly because these products do not have a lot of competition right away, so you have time to act and put up a high quality article about the product/s so Google can spot it and rank it high. It won’t always work like this, but the more you do it, the faster your authority will rise. Directly promoting the product from Amazon. Promoting another product from another affiliate network but using the popularity of the Amazon product to funnel the visitors there. Update 4/6/16: $160 made in 3 days due to this idea! After writing this post and seeing just how many great products and keywords there were, I chose one of them and wrote a post about it on my weight loss site. Now there are a few more sales earlier, but I am only measuring the period after I set up a new article on a popular keyword I found through Amazon’s best seller. It brought in more traffic and this I believe led to more sales. I also know this worked because previously, my sales weren’t as frequent as they are AFTER I set this up so it can only be because of this. By the way, these sales reports are reflected of this website I’ve had which I once though was failing! If you have some money, make sure to set up a PPC campaign with EACH of the articles you write when you find these best selling products. The reason you want to do this is because it’ll get you traffic very quickly and help you find out if there’s good money to be made. 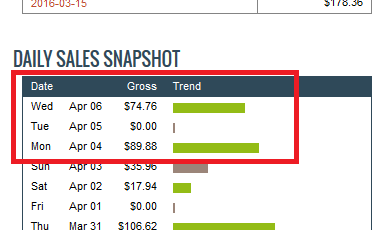 Even if you don’t make any sales, use this strategy to save money (as you saw, I only spend about $4 for 55 clicks!). Now if you do this and see clicks, that means the keyword/topic is popular and you made the right decision to write about it and plus, if you chased the low competition keyword, sooner or later it will rank high organically on Google and it will bring in more traffic. 1) Those 55 clicks you got for $4 over 3 days… do you by any chance know how many keywords you went after and what their combined monthly search volume at the time was? 2) What is the name of this new exit pop up plugin you’re using on your site now for collecting emails? Not too long ago, you didn’t have it on your site but I recently noticed that you have it. Can you please share which one it is? 1) I was going after one popular diet plan on the best seller list (I don’t remember what the name of it was) and the amount of searches that keyword got was in the 1,000’s monthly. 2) I am currently experimenting with a program called Thrive Leads which is what set up the exit pop up on my site. So far, I really like the program and it’s a great way to collect an email list. Here is a full breakdown of Thrive Leads in case you’re interested. This is really awesome! I have a niche website myself currently and sometimes it’s hard to come up with good products to write reviews about. Like you mentioned, I was mostly using Google Trends, but most of the ideas I have turn out to be not that popular at all. This gave me a perfect way to find the products I can use for my reviews, thanks a lot for this 🙂 I have one question though: Amazon doesn’t have a website for my company. Still, for example the US’s Amazon is appealing to me because the consumer market is so big. I would still like to test out the products though before I write a review about them. Do you have any tips on how to achieve this even though I’m not in the same country? Hi Sergio, I am a bit confused as to what you mean by Amazon not being in your “company”. It sounds like you meant country and the associates program they have just isn’t available there, is this the case? If so, you can still try to register with them. Just because one of their branches is in the U.S and another is in places like Europe doesn’t mean they won’t accept you and it certainly doesn’t mean they’ll limit you to the products you can promote. Try to register with them again and if they accept you, then see all the products that are available for you to promote. On the question of trying out products beforehand, this is a great ethical approach to take with your online business. If you love your niche topic, can afford to buy the products you are reviewing, do so. You can also try to find people who own the same products and test them out them through them. And finally, on the topic of Google trends, you can always cross reference the stuff you find on Amazon’s best seller list with Google trends. If you see one or more products match in popularity, you’ve really got a BIG product worth reviewing. Make sure to run it through a third check: Jaaxy, as it’ll tell you how much potential traffic there is. No problem Sergio! If you have issues and they disapprove you, here are some alternatives you can look into. Even in the “worst” case, you still have more opportunities online that you can imagine and they may bring you more income than if you went through Amazon. Thank you for sharing this. I was just wanting to confirm some details with regards to how you write your articles if that’s okay? Do you write one article per product? If so, roughly how many words does each article tend to be? The answer is yes Alex, one product, one keyword focused on that product and one article about the whole thing, which is about 1,000 words typically. You have presented a FABULOUS way to come up with content and products to promote! Way to go! I have had a problem with content ideas because I did pick a very small niche for my website. This is brilliant! I will definitely be trying it out! What plugin or program do you utilize to review your clicks and sales? The pictures that you provided are very clear and concise in their information and I was just wondering what sort of program that it? Thanks for all of this valuable information! It will definitely be used by me! I just take a screenshot for images through my computer, either with the manual screenshot button, OR a program called “Monosnap” Misty, there’s nothing difficult about using either option. As for your question on clicks and sales, for clicks, I utilize Google analytics to overall review how much traffic I get and prettylinks on my actual site to analyze who clicks on links within the site itself. Everything else, in terms of analyzing the data is up to common sense. I don’t think that I’ve ever heard of this method until I read this post! This is an ingenious method of finding out which items are hot and worthy of spending time and energy trying to promote. I totally agree with your viewpoint about needing a specific niche website as well. With so many sites battling for traffic and attention, it is necessary to be specific about what you are offering. Hi Vitaliy, just want to thank you for the honest, helpful and thorough way you run your website! No problem Mike, I’ve had the same problems too before WA and it’s a pleasure to have you there now, thank you for the kind words. I`m never one to leave comments on sites but I felt compelled to this time and to thank you. I do struggle to find good products to promote in my niche and end up writing without knowing if a product will sell or not. Using your tips, I`ve just seen that some products I write about on my niche have almost no searches. Although my site is still new so traffic is still an issue, I will use your tips to find products on Amazon. Hi Roamy, no problem, just know that even though the products you reviewed get no searches, the content you put up on the page is still going to act positively for your SEO so when you do start writing about the good products that do get searches through this method, it will help your SEO a lot. Dude this could be a WSO. Lol. There are some many nuggets here. Ironically I recently just started a new niche site and the focus is reviews since I know it works in the other niche we’re in. I’ve been targeting content of my competitors using SEMRush to see what they’re ranking for and driving traffic to my site. The problem is my site is still new so I’m not ranking as well. But I know in time I will and my strategy will work on this new site. But your technique gives me something that can get me traffic now even being a new site and a faster way to make money with the new site as it builds authority. So thanks for writing this and providing a case study. This should be a course or required training in Wealthy Affiliate. LOL . I always learn something new when I read your stuff or chat with you. Keep it up! Hey Eddy, always great to hear from you! You already know profitable it can be to target keywords and with this strategy you are getting finding those goldmines in sales and keyword competition. All that’s left is to write the article on them. I do admit though, I have gotten lazy on doing this for my other sites since I focus a lot on this one, but anyone can repeat this. Oh my gosh I can’t believe how much time I have spent on your article. I have gone back over it a few times to get the full impact and then I opened up Amazon and went step by step in my niche and followed along with the steps that you laid out in this post. I have to say that I definitely learned a lot about using Amazon Best Sellers. And I realized that I might have been doing things backwards as far as looking for keywords and then going and trying to find a product to promote. I will definitely give your steps a try in my next posting and I have to say a big thank you for you very informative post. That’s a really good idea. I will definitely use it. I bookmarked this page. I searched some best selling products on Amazon and searched keywords about them and I saw that they were decent keywords in terms of competition and searches. Thanks for sharing this. I am having a lot of fun searching for new products to review. You are a genius! I’ve learn something new about ppc from this post. I’ve always steer clear from ppc because I’m not that familiar with it but the numbers you showed are very enticing. I’ll definitely look more into that after this. As always many thanks for sharing this. If you follow my format, you will spend very little on PPC and at the very least if the product is popular enough to generate traffic. From there, you can narrow down if the product is profitable to sell or not and even if it isn’t, the investment to test this is very litle. You know this post is absolutely fabulous and I’ve saved it in my favorites to go back to. You’re right that other marketers haven’t shown us this technique to make money. I’m actually pondering at starting another website, but unsure yet ofwhat niche, so your fab tips will be very useful in helping me make a good decision. Thank you so much. You can do both in this case Kevin as long as you get the traffic from the one or more popular products you find. If my niche is on Chinese and Asian food and recipes, do you have any suggestions on what should I type in Amazon’s search box? I also write on kitchen cookware reviews. Do you usually own the products that you review? So far, I’m using all the products that I’ve reviewed. Thanks for sharing your technique and insights. I will certainly try them out! You can type that exact topic into Amazon Yvonne. The best seller list for that niche is in the “Asian Food” section. Regarding your other niche topic, you should keep them separate as these are 2 different niches. Most of the time I do buy products and review them and it’s good you’re doing that too because it’ll make your reviews much better. Awesome advice! I usually find a low competition keyword and then find a product or write about a product I like. I will definitely try this out and be sure to write about products that are best sellers! Do you think it’s a good idea for young websites to use PPC advertising or just older, more established sites? Depends Christina. If you are low on money and want your new site to be focused more on SEO, then don’t use PPC until you get traffic and sales to cover the costs. If you do have some money to spend on it and are reviewing a product that’s selling a lot, then it’s better to risk PPC and make money more quickly. This is really cool. I love this technique for finding popular items and I can’t believe I’ve never thought of this before. I just did a quick test in one of my niches and I discovered some awesome keywords that I think I could rank easily for. It’s weird though because you would think that if a product is selling really well on Amazon wouldn’t you expect it to have a lot of competition? Or maybe this is a good little secret way of finding the hidden gems. Yeah I also find this vert weird Robert, but I think most competition tends to flock to particular niches like make money online, whereas with Amazon and all the niche products you can find there, there’s just so many possibilities that the competition just can’t find them all. 1. What about using fb ads or posts to drive traffic. 2. You have written in the end that you created ppc campaign for the product. What should generally be the keywords I should use in ppc meant for a product. 1. For FB ads, I don’t really know because the traffic there is different. I would only use this strategy for regular PPC and obviously SEO which actually answers your question about posts. Posts are articles, so they will be indexed on Google and get traffic as well. 2. Usually the EXACT word of the product will get the most clicks. Hi, Thank you so much for the reply. I am really going to give it a try. The only hurdle that I can foresee is the viability. The affiliate program of Amazon is offering very little commission. I can’t recover money spent on ppc if I sell as an amazon affiliate. And, the products are generally available on amazon only. If I divert them to something else, then their likelihood of making a purchase comes down. People on these kws are looking for specific products. Can you help me in this? Well you are right, when you divert visitors away from their main interest, you do lose traffic and commissions, but still if the alternate product you promote has higher commissions, you can still make a profit from an even lower conversion rate through this. That’s exactly what I did here. Plus keep in mind, when you keep adding more and more reviews for popular products and repeating the same strategy, your traffic and profits are going to get even higher so the overall sales are also going to increase. I have written two reviews so far and I feel like they’re shots in the dark (I don’t know maybe that’s how its supposed to feel as you start out) even though the keywords were carefully selected. I feel that this method will take out a lot of the guesswork of traffic generation if you combine proper keyword selection and a product that is already doing well on Amazon. I am going to implement it immediately, thanks. Wow, I’m really impressed! I had no idea about this great strategy and I will definitely try to use it because I’m curious to see the result. The reason why I always skip popular products is because I find it pretty hard to rank for them, especially in the first months. Let’s say, for a site that is only 2 months old, I believe it’s pretty hard to get on the first page for a keyword with a QSR higher than 50. And my mind tells me that if a product is popular, then it will also have a lot of reviews on the internet, on different blog and authority sites, which will be hard for me to overcome. Sometimes it will be competitive but I find for these kinds of products, most of the reviews aren’t on blogs, they are on Amazon itself and I’ve always been able to find a low competition keyword for them too. And even if your site is new, just experiment with PPC. I started getting traffic for the article I wrote within 24 hours and it will sooner or later start getting traffic from SEO too, but while I wait, I am paying very little and it is leading to sales. Basically, if you find the hot product, don’t think it’s too competitive, just write about it! Okay Vitaliy, here’s the deal. I just started internet marketing/affiliate marketing about 2 months ago. Besides the general training I received at WA, this is without a doubt the BEST idea I have seen. I just read through the article once, but I am going to go over it again a few times so it sinks in. I think you are really on to something here. I’m actually excited about this. Thank you so much for sharing. Thanks Jeff, WA did help me create this idea in a way. Excellent information!! I don’t really write reviews, whatsoever, but I think I might do that with Amazon bestsellers. Since I love books, I would even read them myself and provide a quality review on them. This truly is a brilliant idea and thank you for sharing it with us! Also, I saw Alex’s comment about adding GeniusLink and I will definitely check it out too! After all, visitors can be from any part of the world, so it’s safer to serve them with the local Amazon link. Hi Zarina, you should do the product reviews and absolutely buy the books before you review them. I do this as it creates a strong and trustworthy review! This is a brilliant strategy for turning a niche website into a big-time money-maker! Obviously, the list tells you what people are looking for, and if you combine that information with some keyword research, you can begin writing reviews that should see lots of traffic. The only thing that’s a bit of a downer is the commissions Amazon pays – usually around 5%. Private affiliate programs tend to pay much more – 20%+. It could be wise to find best sellers and research if those brands offer their own private affiliate programs as well. That could make things even more lucrative. Actually Matthew, I didn’t say how I made the money. I did promote the Amazon product which is the popular one, but I also funnel traffic to a more higher paying affiliate program. The sales figures you see are from the higher paid one. Hi Vitaliy, this is such a great analysis that I am going to bookmark this article. I am obviously far behind you in all this but I realize that I am following more or less similar logic, though in a totally different niche. So far I have seen that those top sellers are competitive and it is not always easy to find a good keyword. What you show from your own results is really impressive. Not surprising when one reads this text, you understand this all very well. Did not understand the sentence about comparison with Google trends. What makes Google trends much better? Hi Jovo, Google trends can potentially be much better because if a topic or product that is is niche specific to you starts trending, you’re talking about a lot more traffic vs what you would find on Amazon, but those don’t happen a lot, thus Amazon is more stable to find products/keywords through. OK, thanks a lot. I read again and realized that I have mixed up the bit about top sellers and items that have many reviews. The latter are frequently top sellers but not always, they may simply be good selling items that have been there for a long time and collected many reviews through years. The issue I am facing is this: I see items with many reviews, popular for many years, and then there is a new version of the same product. No reviews at all. Good item to review? Yes I would review the new version, especially if it has a different name to it. Furthermore, I’d also write a review for the previous product and interlink them together. Wow that is quite the post. 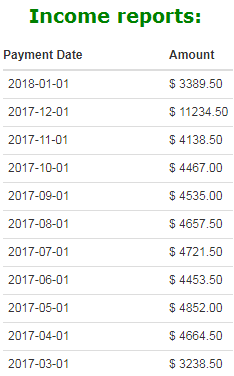 I’ve been doing affiliate marketing since August without much success. I’ve focused more on keywords the last few months and things are starting to pick up. I need to write more reviews and seeing the success you’ve had, just reaffirms that. I focus more on herbs so its kind of hard to find products but I’m sure if I try hard enough it will work. How long have you had your weight loss website? That’s really impressive you get so many views from that one review. Thanks for this, I’ll have to reread it to get more ideas. You can promote herbal products, teas, books and anything like that, just type herbs into the search, see which products come up and then look for best sellers which fit your criteria. I’ve had my site about 2 years now. Love it man, this is genius and I’ll be going after some bestsellers. I’ve never heard of using that program before Alex, but thank you for sharing!